History: Wendy came to TAGS to find her lifetime home after her 51-race career ended in April, 2014, with a broken leg. Her leg was set and has now healed with no visible adverse effects. All of Wendy’s races were at Wheeling Downs. She’s been chillin’ at the farm while she recovered from her injury. Her CTW kennel (Clear the Way) lineage contains two illustrious grandparents, Trent Lee and Craigie Whistler. We will know more about her after she settles in a bit. 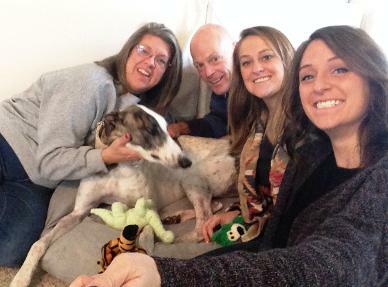 Wendy (now Aurora) quickly found a home with the Curtis family. December 29, 2014 update: Wendy (now Aurora) quickly found a home with the Curtis family in Keller. Congrats to all! December 18, 2014 update: Wendy came to TAGS to find her lifetime home.